Australian-born and New York-based Painter and Performance Artist Theresa Byrnes talks with Artifactoid about inspiration, a return to her roots as a painter, and her most recent performance, “Mudbird,” created in collaboration with her 20-month-old son. Artifactoid: How did you get started as an artist? TB: At age 16 in 1985, my studio was the family lounge and dining area. I would start to paint every night after dinner while everyone watched TV. By the time everyone went off to bed one by one, I would get more and more on a roll. I would paint through the night. 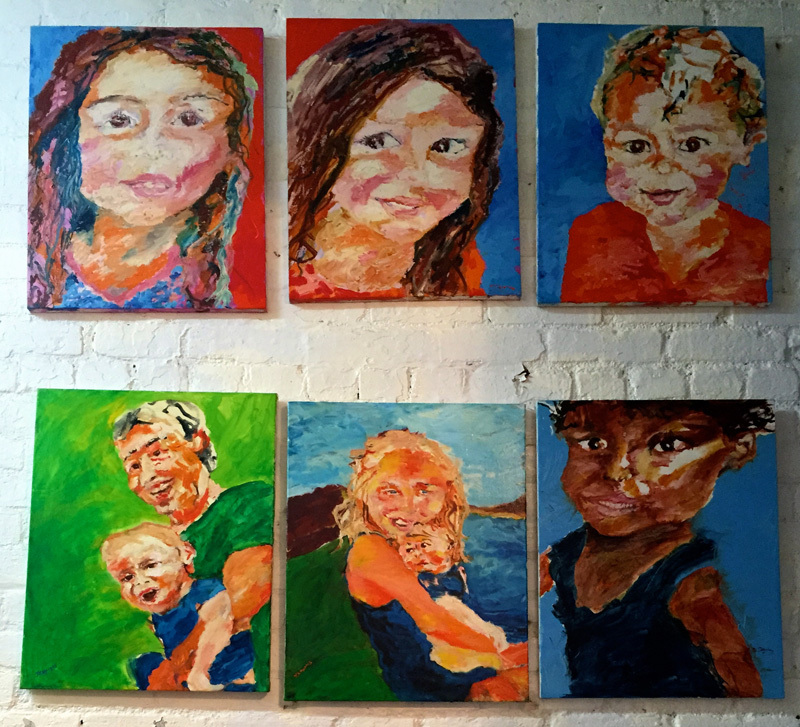 Soon I outgrew the family room, no longer able to pack all my canvases neatly every night without disrupting my process or running the risk of wet work being trodden on when the the family awoke. I scoured the classifieds to find a studio. I found part of a warehouse to rent cheaply, so I did. 29 years ago, at age 17 in 1986, I began to paint full-time in my very own studio! I had already been included in minor group shows from 14 years of age and on. While in high school I did life drawing classes at night, and some of my drawings were selected for a group show. I went out on a limb and contacted a curator who included my work in a rotating VIP lounge, and my work began to sell. My first solo exhibition was at 17, but I consider being an artist about making art more than about exhibiting or selling it. Artifactoid: Who are your biggest influences in performance art and why? Who inspires you? TB: I did my first performance when I was 19 in 1989 in Sydney Australia’s Chinatown. The piece, titled “China Crisis,” was my response to the Tiananmen Square Massacre. My entrance into doing performance art was not inspired by an artist, but by heroic dissent. The cry out for freedom and justice inspires me. In “China Crisis,” I laid in front of a large red painting. For me, performance is a natural spill-over from painting: paint is my language, I just commit my body to performance. 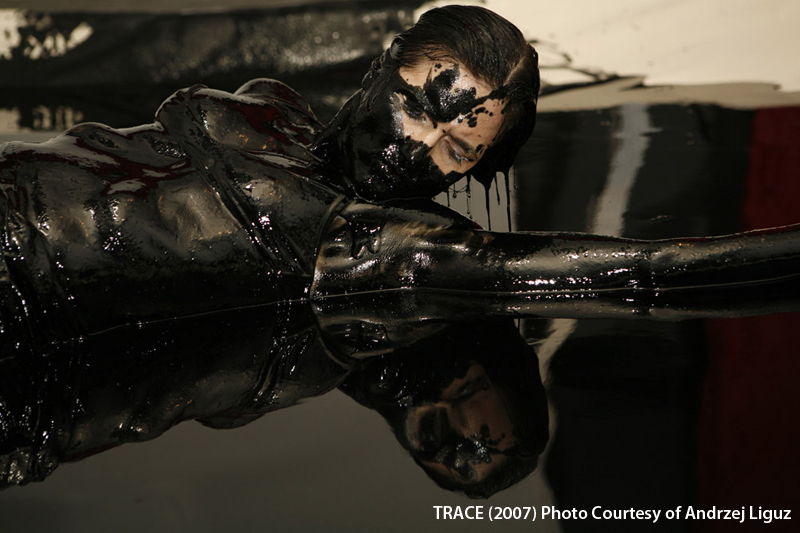 “TRACE” (2007) was inspired by a dying bird in an oil spill. In “DUST TO DUST” (2011), dirt was my inspiration – the transformative power of mulch. In 2002, I met Carolee Schneemann; we read each other’s books (mine The Divine Mistake, her’s More Than Meat Joy). I learned a lot about her work, and felt connected to her even more once I learned that she is also a painter whose performance flows from that. Artifactoid: What are some of your biggest day-to-day influences as an artist? TB: Stains on the sidewalks, streaks with random marks on windows – I made a short film about sidewalk markings titled, CARELESS in 2000. Tunde Adebimpe (TV on the Radio) helped me shoot and edit it (he is now my son’s godfather). It was screened at MONA (Detroit) in 2001. 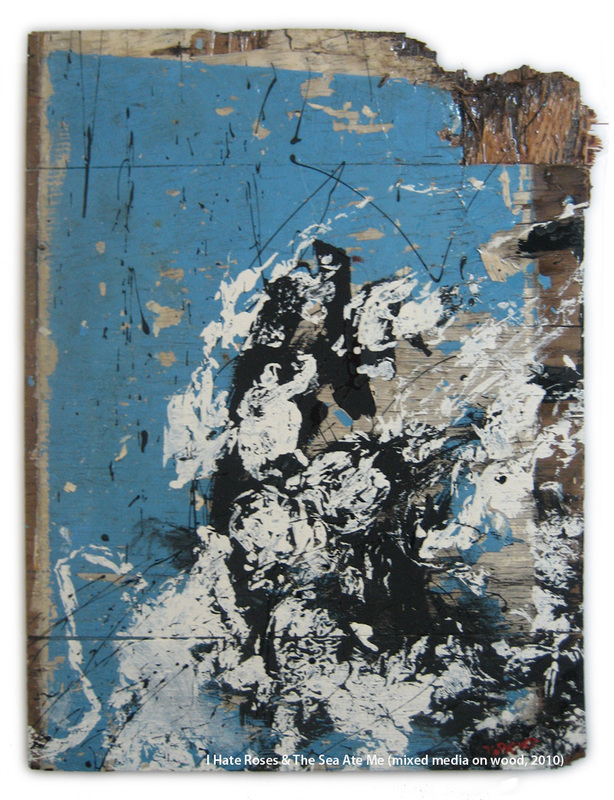 Old, decaying wood also inspires me, I have done several painting series on aged wood 2001 and 2010. When I paint on aging wood, I feel like I am collaborating with nature, not trying to capture it. Artifactoid: How has your perspective as an artist changed over time? TB: That nothing is permanent. Earlier in my career, well, pre-September 11th, I cared greatly about paintings lasting forever. Now I feel “archival” materials are pitched to artists who believe this civilization will survive another 500-1000 years. I am into showing who we are now, because now is real: all we have, vulnerable, avoided, denied, unnoticed. 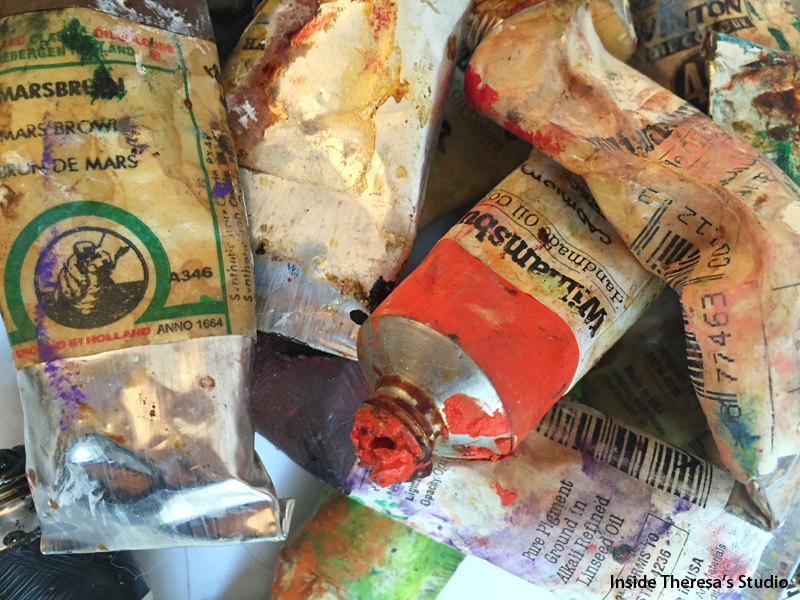 Art materials are everywhere; they’re not limited to an art store. I love to work with mud and hair and other ingredients as well as ink and oil paint. Artifactoid: What are some of the most important lessons you’ve learned through your art? TB: That nothing is a mistake. Mistakes in painting are like an angel pushed your hand, changing your direction to somewhere you never would have gone. In my entire 30-year career, painting still genuinely astounds me – the unguessable moment it resolves. Artifactoid: What is the best advice you’ve ever received in your career? Artifactoid: In what direction would you like to take your art moving forward? TB: I am at a turning point. I am returning to my roots as a painter, where I first discovered my talent and lost my identity/sense of separation from art in the process: painting portraits. For the next two years, I will only paint portraits. Abstraction and performance art lent to my feeling immortal, but now, I am a mother and I feel human, more grounded and more vulnerable than ever. I am pulled to dive in in this direction. Artifactoid: What advice would you give to other artists? Artifactoid: Please describe your inspiration behind “Mudbird,” and some of the most important things about the piece (to you). TB: “Mudbird” is the second performance I have done with my son, Sparrow, (now 20 months old). 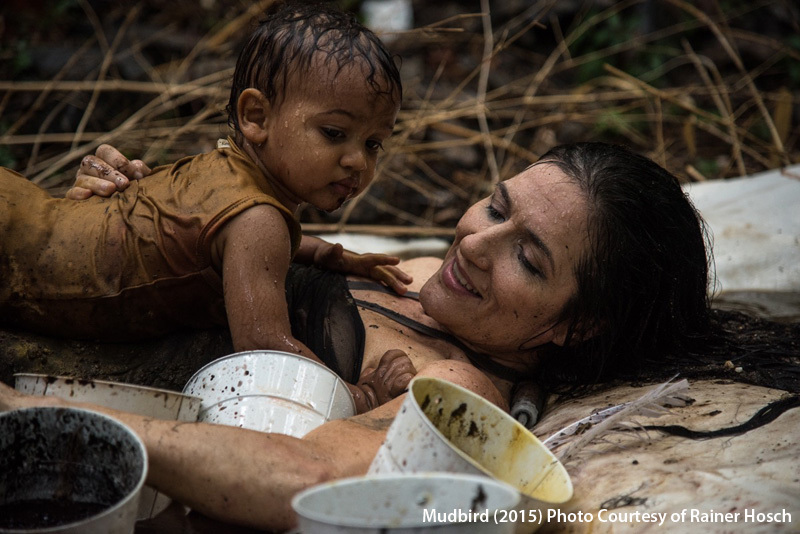 In “Mudbird” I play with my baby in the mud thinking of the cycle of all beings – to live and die. We come from the earth and end up in it. Mud; earth, is a uniting and dividing force between mother and child. I gave my life for his to begin. Okay, I am not dead yet, but a part of me has died – my life as a single artist. At the time of performance, I felt a sense of my immanent death. I have Friedrich’s Ataxia (FA). It is a chronic and fatal genetic disorder of the nervous system. I have been wheelchair-mobile for 20 years. My voice slurring, mundane things slowly getting harder, and recently I tore my right rotator cuff. I have never felt disabled, as I have always fulfilled my aims and called the shots, but post-birth and with injury, I felt unusualły hopeless. Sure I cannot walk, but now I can’t fly; wings clipped. Much of the “Mudbird” series is about my burial and Sparrow’s flight. It has been a burial of several parts of myself. And now I again recreate myself, or return to who I am. Theresa Byrnes has had over 25 solo shows at spaces including Saatchi & Saatchi in New York and Sydney, and the Australian Embassy in Washington D.C. In 1996, she was awarded Young Australian of the Year. To keep up with Theresa and her latest works, visit her website and follow her on Instagram, Twitter and Facebook. Stop by her gallery space, TBG (616 East 9th street between Avenues B&C), for her next opening on December 9th, 2015 . 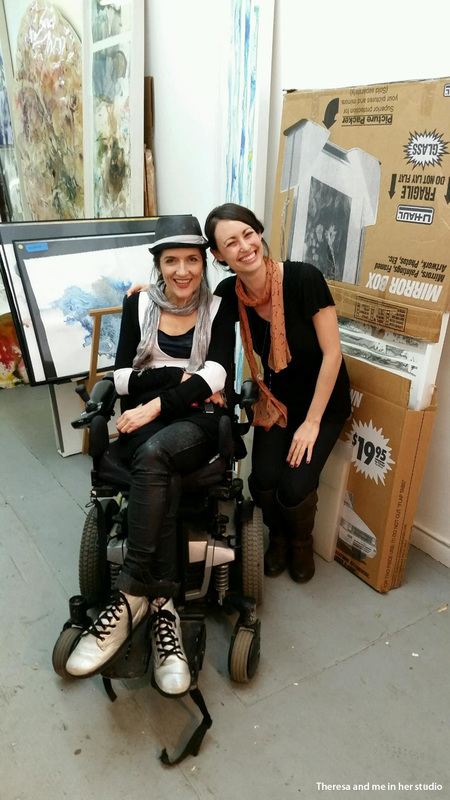 Posted on November 4, 2015 November 5, 2015 by Artifactoid	This entry was posted in Interviews and tagged Alphabet City, Art, Artist, Artist Interview, Australia, Contemporary Art, East Village, Friedrich's Ataxia, Interview, Motherhood, NYC, Paint, Painter, Painting, Performance, Performance Art, Portrait. Bookmark the permalink. I have such great respect for this artist’s lifelong vision as AF so perfectly revealed throughout this interview. Tears welled up in my eyes knowing her condition and child’s participation in her art-very touching and moving piece. Thanks AF for bringing her to my attention and enlivening my day being inspired by her journey and art.